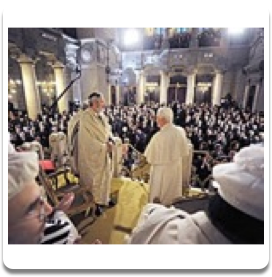 by John Vennari, Includes an update on the disturbing new Vatican document on the Jews released on December 10. A revealing presentation in which Mr. Vennari spotlights the work of progressivist theologians on a “new approach to the Jews” leading up to Vatican II . Lays out the modernist principles on which today’s theologians operate, as enunciated by the progressivist Jesuit Jacque Dupuis. Gives you a true understanding of the revolutionary nature of Vatican II’s new approach, and the fact that it is incompatible with the Traditional teaching of the Church. What is the new reading of Saint Paul’s Letter to the Romans? How do today’s Church leaders justify the claim that it is no longer necessary for Jews to convert to Christ’s true Church for salvation? Details the modernist theologians in the late 1940s to the early 60s that paved the way for the new approach, and it is a new approach. Learn why Catholics must no longer be on the defensive, but on the offensive against the novelties of Vatican II. Covers this and much more.